The premium conductive fabrics we produce at Swift Textile Metalizing LLC set the standard for quality. 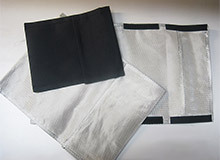 The product highlighted here is a two layer nickel and silver rip stop pouch with a hook and loop closure. These bags are used for EMI shielding applications in the mobile forensics industry. The metalized fabric is 0.01" thick and is laminated with a 2-ply silver-nickel coating. Our proprietary coating processes result in metalized fabrics that maintain the desired level of flexibility and durability. The coated fabric is cut to size and stitched together to create the custom bag. Dimensional tolerances as tight as ±0.125" are held according to customer specifications. Bags are produced in multiple sizes including widths from 6 inches to 17 inches and lengths from 5 inches to 15 inches, and are custom printed to customer specifications. The hook and loop closure allows for repeated use and provides a completely enclosed EMI shielding solution. These bags are produced with an approximate 4 to 6 week lead time per order. For additional information about this custom EMI shielded packaging project, see the table below, or contact us directly.